With 18 slopes and trails, Cataloochee Ski Area offers mountains of fun for everyone, from skiers to snowboarders, from novices to veterans. Beginners can get a feel for things on a couple of smooth, gentle slopes (classes and private lessons are also available), while the more adventurous can head to the ramps, rails and boxes at the Cat Cage Terrain Park. For those with a need for speed, there’s plenty of steepness on this mountain. Nestled in the Great Smoky Mountains, the surrounding views are magical. For ski report, call 828-926-3588 or 800-768-3588. Check out www.kidsskifree.com for a great promotional offer. Here are a few of the most frequent questions asked about what to expect from your visit with us as well. 1. What will it cost to ski at Cataloochee? Lift ticket pricing ranges from $41 weekdays to $67 weekends at Cataloochee. Ski and snowboard equipment can be rented at the ski area with ski rental costs ranging from $25 for juniors to $30 on adults for either skis or snowboards for any session. Outer gear rentals such as overall bibs and jackets and accessories can be found either at Cataloochee Ski & Sports Shop in Maggie Valley or here on the mountain at The Shop at Cataloochee. Bib and jacket rentals are available for a $9 per piece or $16 for the set. 2. How long will it take to be able to ski or ride? Just in your first day, you’ll learn how to turn, slow down, stop and ride the lifts. Generally if you are trying skiing for the first time, you should be able to do quite a bit on your first day. Snowboarding is a bit more difficult the first time. However, the learning curve is much easier after just a few tries. 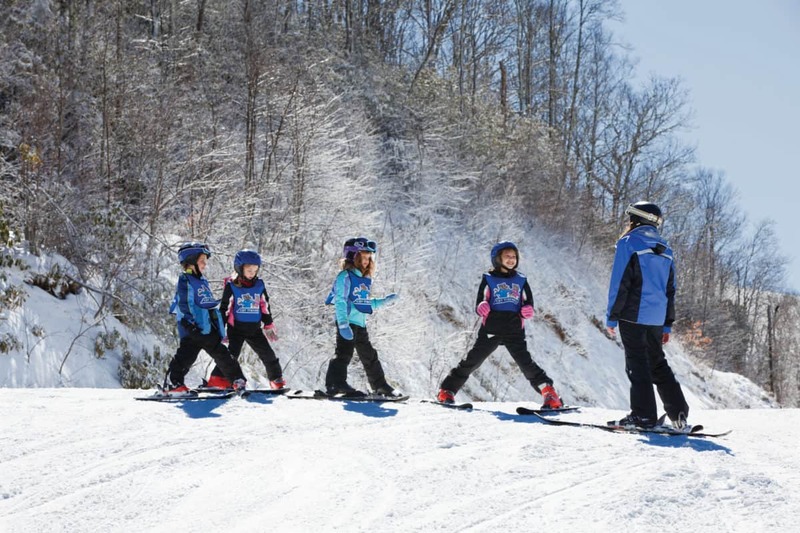 With the help of Cataloochee’s staff of trained ski and snowboard instructors, you’ll be skiing and riding in no time. 3. Do I have to be in shape? You don’t have to be an athlete to ski. However, if you do some exercises before your first ski experience, you will enjoy it more. First of all, you’ll learn faster, because you won’t tire so easily during the learning process. You’re going to fall down some while learning so you’ll bounce back better if you’re in shape. Walking briskly, jogging, jumping rope and stretching are best. 4. Should I take a lesson? YES! It’s the easiest and quickest way to learn. 5. How can I find out the conditions before I go? Cataloochee publishes a “conditions” report or a “snow report.” It’s done on a daily basis and gives you a summary of the temperatures, trails open, lifts running, weather conditions, and more. We update our reports every evening after close. We put our conditions report on our website, phone systems, and publish it to all the major news agencies that report national ski conditions. 6. What do I bring? Below is a list of items that will help to make your first day at Cataloochee a great one. This list is meant to only be a suggestion and is dependent entirely on your preferences. Remember, ski bibs and jackets can be rented from Cataloochee Ski & Sports Shop in Maggie Valley as well as The Shop @ Cataloochee for $9.00 per day or rent the set for $16 per day.